The wood-finish closet system adds an air of glamour with its natural intricate texture and color. These systems trend more and more toward extravagant and luxurious-looking designs and can be traditional or modern styles. 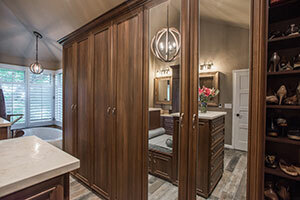 Even wood closets in a distressed or rustic look lean toward luxury. Wood closet systems are an area that Closet Factory has specialized in for more than twenty years. They offer a full selection of species to pick from such as Maple, Cherry, White or Red Oak, along with exotics like Rift cut Oak, Birdseye, and African Mahogany. Closet Factory offers sustainable woods responsibly sourced. Panels and shelves are made from veneer on plywood while the fronts can have solid wood edges added to them. Wood edges come in many profiles allowing one to customize their system in many unique ways. In addition to edges, there is a complete selection of solid wood cabinet doors and drawer faces, crown and base moldings, and onlays and embellishments, to select from to further enrich the design and texture of the overall closet system. 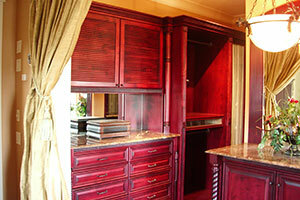 Few if any other Closet Companies offer in-house staining and painting as Closet Factory does. Most factories have a stain booth on the premises, and all offer a variety of popular and trending colors and glazes. For those that want the look of wood but not the expense, a hybrid of melamine with solid wood edges is a favorite. The wood closet has been a staple throughout the ages because of its classic appeal. However, with home renovation and custom design on the rise, it has become more of a popular alternative for those who are looking to expand their current closets and finally get organized in high fashion. For many, the closet is a very special place that is no longer being overlooked and designed only for function. Nowadays master bedroom walk-in closets are essentially an extension of the bedroom, and so the design must complement the room’s aesthetic and suit the personal tastes of the homeowner. Women and men alike are becoming increasingly invested in closet spaces truly deserving of housing their precious wares. Men, in particular, are gravitating towards the richness of wood closet systems adding a cabinetry style finish to them. They can store designer suits and shoes behind doors within the closet storage system that feels more masculine and slightly rustic — styles as well as more elegant designs. Typically wood closets are designed in a similar way to any other storage system, so a designer will begin with an organizational layout or floor plan while assessing your clothing collection and space. However, when it comes to styling the closet skill and expertise are required. Best to tell the service coordinator when booking the design appointment that there is a serious interest in exploring wood. Your designer will provide recommendations based on your current needs and the area of workable space. There are many different types of wood closets to choose from like walk-ins, dressing rooms, and wardrobe closets. These types of systems work well if you desire wood with a variety of trimmings and wood elements. A budget for the project will also be a consideration to discuss with the designer since wood is more costly than working in melamine. During the design process, your designer will integrate complementary accessories and embellishments like architectural moldings, solid wood doors and drawer fronts. Another critical element is to determine the thickness of the system’s shelves and panels. With regards to panels and shelving, our designers can recommend paneling thicker than the normal ¾” thick profiles, reaching up to 2 1/4” thick and upward. Our designers can recommend a wide variety of options including moldings and millwork in Acanthus Leaves, Rope, Egg, and Dart. Perhaps, you’ll want more subtle options with a more colonial and subdued look and feel. For those who are seeking a more luxurious style for your wood closet, consider onlays to create designs like lions with wings, scrolls and other elements to add extravagance. Now that your wood system has all the essentials, you’ll want to consider the final element – the finish. For some, this may include several colors or the addition of glazing while others prefer a clear coat showing off the natural color of the wood. The stain is one of the most important details when designing your dream wood closet; we understand that your finish can indeed set the tone for the project. Maple walk-in with large corbels and Acanthus crown and accents. Mirror doors cover hanging that make a 3 way mirror when open. Solid wood counter matches accents in fluted columns. Coffee glazing adds depth to the finish. 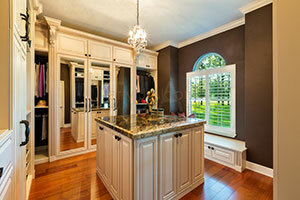 Cabinets for shoes show off crown molding and Acanthus corbels. 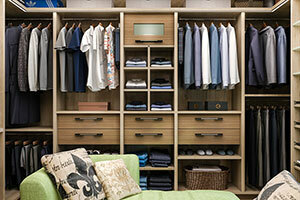 Visit custom closets and get design inspiration for your wood closet system.